Hi Defendermad, I did tell you I had been off forums for a while now, and it was me doing all the updating. 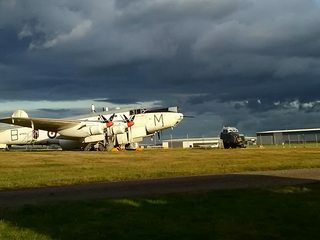 The winding down of certain operations at Coventry doesn't appear to affect Nimrod or Shackleton, Nimrod ran up last weekend, and people were on site at the Shackleton working on an engine starting issue on No 4, a few weeks previous they were running the other three engines. Also over the past few months they've been moving and reorganising the off site store. Oh, and the hydraulics are now intact and awaiting testing. So work is still happening and interest is still there for the aircraft. Similarly, the Charities Commision were asking questions of SPT; but I'm not sure its an investigation now, as there's no press release, or inquiry report or record on the Commissions site. I guess time will tell on that one, but as SPT didn't own WR963 nothing will stop anyway. With regards to updates, until someone takes up the reins and starts feeding stuff out to the public, its going to be a little quiet. Its not neccessarily a bad thing... it lets all those that keep spreading doom and gloom rumours get the wind out their guts and fade away. If things continue on the current course things will soon be back to the strength they were a few years back. Understand they found the no4 engine starting issue today, so no4 engine is running well again. Lots getting done on this Shack. Firstly I'd like to apologise for the lack of updates on the various forums, and the sporadic and sometimes contradictory information that was sometimes posted on social media. Hopefully these times are behind us now and normal service can be resumed. As I'm sure you can understand it's been a troublesome year for WR963 and the remaining crew. I'm Phil, richw_82's brother. I'll be posting the regular updates from now on and hopefully answering any and all questions you all have to the best of my ability. Although I'm not quite as knowledgeable as my brother, I work on WR963 regularly, I'm qualified to crew her as P2, admin on the two facebook groups we run, run the eBay shop and assist with the Instagram account and website building. More recently I've taken over running the "Friends" side of things and I'm one of the two directors of the company that owns and looks after WR963. So I hope that I'll be up to the task. We've had a bad year in terms of reliability, Hydraulic issues on the last evening run back in February and starting issues with the engines since. Coupled with radio problems too and it's not been the year we wanted or expected. We've slowly been working our way through these problems though, and I'm pleased to announce that WR963 is now servicable and capable of running all 4 engines. As Vulcan558 says, the number 4 engine problem has now been found and fixed. Initially thought to be fouled plugs, these were stripped, cleaned, gapped and refitted. We checked for power getting to the booster coil and magneto, and the points were cleaned and gapped in both. Still it refused to run. Eventually, we found that although power was getting to the booster coil, it wasn't supplying power out and once swapped for a brand new unit from our stores the no4 engine ran beautifully. The offending booster coil can be seen in the above picture, the large box almost in the centre with the "X" on it. Hydraulic issues are drawing to a close too, the Hydraulc pumps have both been removed, sent away to be fully rebuilt and refitted. A fully rebuilt hand pump, cleaned and remade lines, cleaned filters and solenoids, and correctly adjusted pressure reducing valves should now see these problems cured. 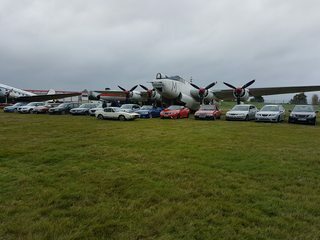 The next run we have is this weekend, the Saab club is hosting their AGM at Midland Aviation museum and we're providing a 4 engined run as entertainment afterwards. I'll take photos and report back on Sunday! Fingers crossed for the first 4 engined run since February. Sorry for the lengthy first post, believe me I've condensed a LOT of work into this update, I didn't want to swamp the place on my first go. All 4 engines turning and running sweet Today. Today couldn't have gone better. 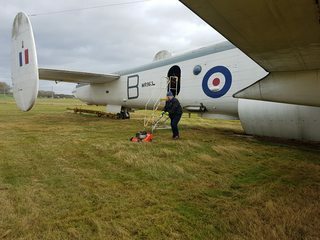 Despite threats of storms and heavy winds, WR963 volunteers were out in force working towards making our first proper event since February a success. And what a success it was. 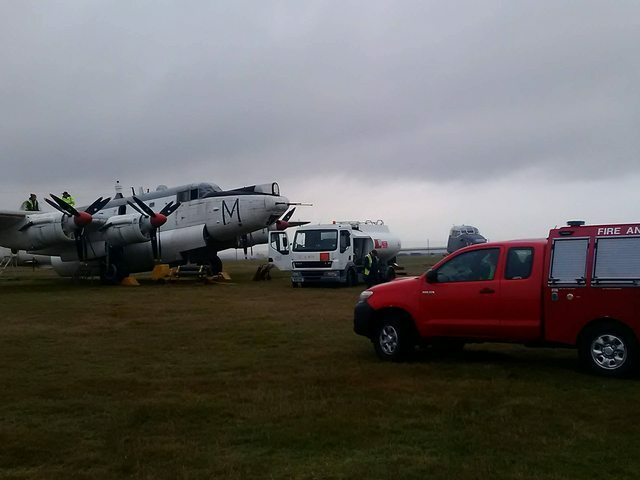 On site from around 9am, checks to the aircraft were completed quickly enough. These are many and varied, but are mainly safety and maintenance checks to help ensure the run is a good one. We check for water in the fuel, make sure the priming pumps and booster coils are working, remove all the various covers, top up the Nitrogen in the brakes and undercarriage and check that all the spinner locks are in place to name a few. We then spin the propellors one complete revolution by hand. This allows any water that is sitting in the bottom of the spinners to drain out. We even found time to mow the grass. By the time these were done the cars started to arrive. We were asked some time ago the host the Saab club for their after AGM meet and they arrived in force. Once everyone was ready and the fuel lines had been primed, external power was connected and away we went. All For Griffons ran perfectly. No snags, no leaks, no problems at all. We ran for around half an hour today, got the engines fully up to temperature for the first time in a while. Unfortunately we couldn't exercise them as much as we wanted, due to a VERY strong headwind we only took the engines to 1800rpm, one at a time. All in all an amazing day, hard work and teamwork and we got there. Our new revamped shop took some good sales too....being able to pay by card helped a lot of people buy more than they usually would have...there were a lot of WR963 hats around today. So...whats next. Work will continue on the hydraulics, we're close to compleing a complete overhaul of the system and we'd like to have it done for our end of season dusk run on the 2nd of December. Tomorrow is a work day for us, and although the forecast isn't great we'll be there. We have a list of jobs to get through before winter hits, and before our dusk run. I'll have photos and an update for everyone tomorrow. Thanks for the more regular updates Phil, all the work the team does is appreciated. It was a pleasant surprise last week to see the 4 engine run, as I had gone along to support 232 as usual but knew nothing of the Saab event (the flags should have been a clue!) until I noticed them driving in. Shall look forward to the dusk run, with hopefully slightly less windy conditions. Today's work day was all about preparation. Winter is around the corner and there's certainly more cold days and rain coming our way. We want to protect 963 as best we can over the winter months so today we decided to make a start. All the engine/wheel/cockpit/glass covers were taken out of storage, cleaned and inspected. We have a full set and although some need localised repairs we've started to fit them, and after the dusk run they'll all be on to keep her as dry and safe as possible. 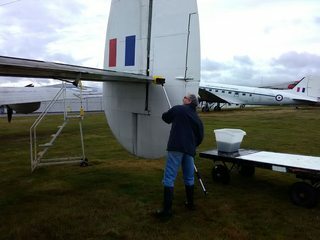 Other maintenance work included cleaning all of the many and varied drains out, rotating the propellers to ensure no water gather's in the spinners and exercising the ailerons and elevators for the same reason. Also, and well overdue, the entire starboard side was cleaned to remove all the dirt and algea and I'm sure you'll agree she looks great. The port side will be next. No major work to report at this time of year, but this work is vital to keep WR963 serviceable and stop deterioration. A very good Report on the trials of keeping an aircraft outside in the UK climate. Please allow me to contribute ideas, as I'm not in a position to physically join the Maintenance Team. Your detailed issues have started me thinking? a] Whilst it's always been 'correct' to park the props in the 'Y' format, is there any advantage in inverting that case to potentially reduce the rainwater route-in to the one pair of blades & not four? b] Whilst not naming specific products, I have used water-diluted industrial curtain-wash (for Lorries & Trailers, not your Mums' curtains!) which removes all crud, moss, algae & 'black streaks' by simply spraying from a hand-pumped sprayer & agitating with a soft brush (& broom for the Shackleton ) before washing-off. Obviously a pressure-washer on a low setting would be best, but there's too much risk of forcing water into the airframe at this time of year? Good news is ....it works fine by just mopping/sponging with cold water. c] Bad News is ... you now have zero surface protection for the painted surfaces & a mega-prepared Algae-farm! Immediately after the above noted treatment, & before the surface dries, you then apply another application of cold-water rinse...WITH a very small quantity of a proprietary "Rinse-Aid" Product. Apply sparingly with Mop/Sponge to 100% of the surface & just leave alone! (in this case, if it were a car you would dry with a micro-fibre towel for a showroom shine ) This will cause the rain, moisture & airborne pollutants to bead & run-off. There is also enhanced resistance to Guano & more common Pidgeon poo sticking to the surfaces!! d) All door, control-surface, etc external hinges can be sprayed with PTFE lubricant which displaces moisture & repels long-term. Exposed hydraulic rams can be sprayed with white grease to protect, but should be wiped prior to actuation. HTH. Try a small bottle of D***n Rinse on a wet area just cleaned (presumably with soap & water, from pictures?) & you will be convinced! Then perhaps pursue a commercial sponsorship package for supply of this going forward. Please note that beyond recommendation by usage, I personally have no affiliation with any Suppliers! Please see the AutoSmart Product website & the Product range indicated by the following link (courtesy of Farnell Ltd) http://www.farnell.com/datasheets/1634812.pdf for clues! 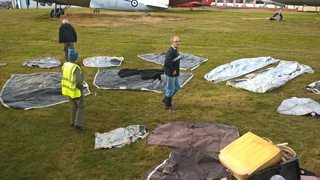 No great knowledge on Shackleton spinners, but I'd guess that the rain is going to get in regardless of how you arrange the props. The 'Y' position is probably favoured to help it to drain out again...! Stagger2 wrote: a] Whilst it's always been 'correct' to park the props in the 'Y' format, is there any advantage in inverting that case to potentially reduce the rainwater route-in to the one pair of blades & not four? With no blade at the bottom, you can end up with several litres of water collecting in the lower half of the spinner. At this time of year its worse as it can freeze and it will produce enough of an off balance that it can throw a spinner off in violent fashon. The idea of the "Y" is to make it as easy as possible for the water to get out. Stagger2 wrote: b] Whilst not naming specific products, I have used water-diluted industrial curtain-wash (for Lorries & Trailers, not your Mums' curtains!) which removes all crud, moss, algae & 'black streaks' by simply spraying from a hand-pumped sprayer & agitating with a soft brush (& broom for the Shackleton ) before washing-off. Obviously a pressure-washer on a low setting would be best, but there's too much risk of forcing water into the airframe at this time of year? Good news is ....it works fine by just mopping/sponging with cold water. There is an algae killer used in the wash process, I forget what it is. Stagger2 wrote: c] Bad News is ... you now have zero surface protection for the painted surfaces & a mega-prepared Algae-farm! Immediately after the above noted treatment, & before the surface dries, you then apply another application of cold-water rinse...WITH a very small quantity of a proprietary "Rinse-Aid" Product. Apply sparingly with Mop/Sponge to 100% of the surface & just leave alone! (in this case, if it were a car you would dry with a micro-fibre towel for a showroom shine ) This will cause the rain, moisture & airborne pollutants to bead & run-off. There is also enhanced resistance to Guano & more common Pidgeon poo sticking to the surfaces!! The good news is the team regularly get the polishing cloth out. The bad news is she's on grass and that 90% of the time one side doesn't get much sun - more so at this time of year. The algae will grow regardless. I understand negotiations are ongoing to get her on the tarmac, as there's certain areas in the back corners of the bomb bay that are starting to suffer from corrosion. Stagger2 wrote: d) All door, control-surface, etc external hinges can be sprayed with PTFE lubricant which displaces moisture & repels long-term. Exposed hydraulic rams can be sprayed with white grease to protect, but should be wiped prior to actuation. Right idea, wrong product! The correct lubricants are specified in the manuals, particularly the Shackletons own anti-deterioration schedule. Exposed hydraulic rams get a wipe with OM15 on the exposed portions if they are items which are used regularly, or a thicker general purpose grease if they are something that won't be going anywhere (undercarriage rams). There's a standing sponsorship with Sil-Mid Ltd who supply everything WR963 in terms of oils or lubricant. The upcoming event on the 02nd December, do you know what time the engine run will be as event closes at 17.00hrs and would like to see run in the dark? rob68 wrote: The upcoming event on the 02nd December, do you know what time the engine run will be as event closes at 17.00hrs and would like to see run in the dark? Engine start will be approximately 4.15pm and the run will last for half an hour. You should get to see her run in almost daylight, dusk and near dark. We're keeping an eye on the forecast and have our fingers crossed. Do you have your ticket? Sorry I've been quiet for a while, it doesn't mean we've not been busy...quite the opposite. Thank you everyone for the continued support, both on here and other forums and social media, it does mean a lot to us all. So...what have we been up to? The answer is a lot of planning for next year, and a lot of preparation for next weeks dusk run. Tired of problems this past year we've been checking and rechecking everything before next week, and even conducted a short 4 engine run last weekend. I'm pleased to report everything went fine, a couple of small snags, one being a recurring oil weep on the number 4 engine which we'll keep an eye on and fix over winter. It won't affect next weeks run though. 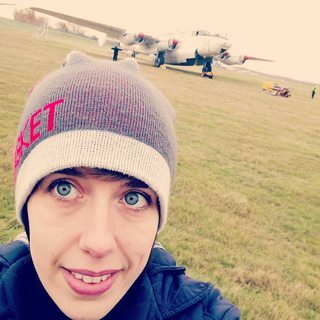 My lovely wife taking a "selfie" with WR963 during our test run...you won't see me, I was sat at the engineers panel. New astrodome cover with new bungees. 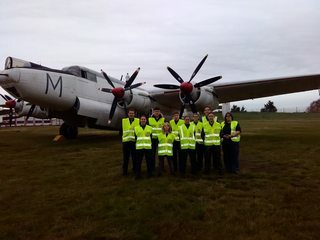 We also had the pleasure of giving several local air cadets a tour of the aircraft inside and out, we try to do as many tours as possible throughout the year as it helps get our name out there, and the more people that hear about us the better chance we have...plus we all like talking about '963! 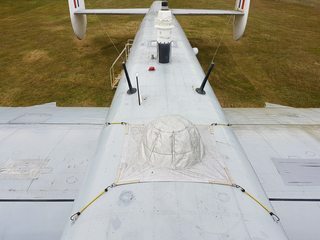 We're still working on the covers which is turning into a bigger task than we liked, but the bungees on most of them have been replaced and before we leave next week they will all be in place, keeping '963 as dry as possible. With regards to NDT testing, yes it will be going ahead. We have the money for it, all we're waiting for is available indoor space to conduct it. It will come in time though and as soon as I know something I'll be sure to post up and let everyone know. I've had custom made tarps done for jet skis, trailers and caravans over the years. We've got the covers, and they're in good condition it's mainly the ropes/bungees that were the problem. Thanks for the tip though, we'll keep their details as you never know what we may need in the future. They supply the bungee cord if your in need of that. So...who watched the live feed then? Saturday was amazing. A busy day but very productive and a great way to end the season. We got to Coventry early, hopeful for a cold clear day so we could methodically work through the list of jobs needing to be done. Unfortunately we were greeted by drizzle. Freezing cold drizzle. 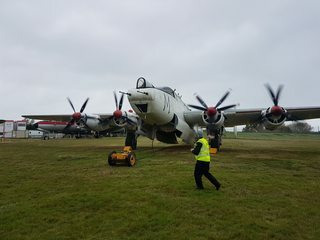 First tasks were the usual safety and maintenance checks, spinner locks, control locks, check for water in the fuel, rotate the props by hand once to drain the water from the spinners, remove the wheel and other covers...all little jobs but all essential. 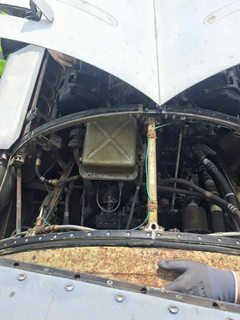 We then moved onto checking the priming pumps and booster coils, these have let us down in the past and caused a 3 or even 2 engine run, something we didn't want to happen. Everything checked out fine, so while the shop was getting tidied ready for our guests, we waited for the fuel to arrive. We took on around 700 litres or 100LL Avgas, plenty for this run and the next couple. We calculate fuel figures based on what is left in the tanks to ensure even fuel loads in the tanks, it helps while she's sitting to keep the weight even. After priming the injectors there wasn't much to do other than talk to our guests and wait for Dusk. We were very lucky to meet Roger Steggall, an ex crew member who had clocked up over 56 flights on WR963, so listening to his stories was certainly a privilege, we hope to have him back early next year to take his old seat during a run. After the Nimrod shut down, it was our turn. 30 minutes of Noise, and a very sweet running Shackleton. slightly grumpy on Number 1 and 4 engines, but they soon smoothed out and the run couldn't have been better. So what next for 963? Not much this year. We'll be back down at Coventry on the 16th, fitting all the covers and making sure she's safe and sound, ready for our Christmas break...then it's off to the Oak at Baginton for a well deserved beer with all the crew. We have big plans for 2018, things we've never done before! I don't want to ruin the surprise so you'll have to wait and see in the new year, but it's sure going to be fun! Looking forward to surprises in 2018! Fab news guys, looking forward to seeing what news comes next year! Last edited by flashman8 on Sun 08 Jul 2018, 8:07 pm, edited 1 time in total. I popped by yesterday to the RAF100 event, a very good do and the food was delicious. 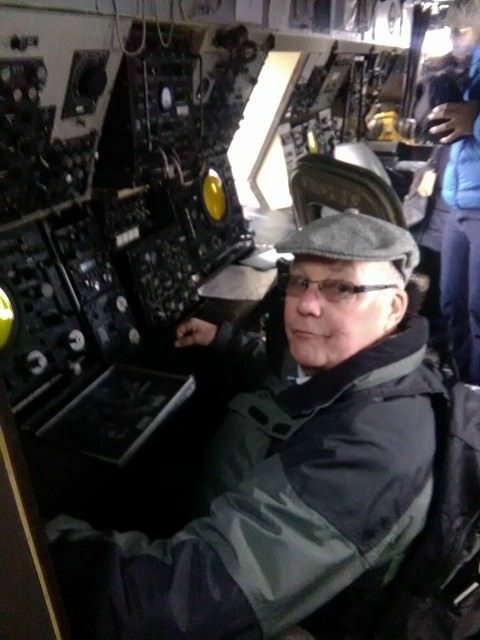 Your website had it down as a workday, but there was nobody there, a guy had travelled a long way for a prearranged tour of the Nimrod, but they weren't there either! Is there any up to date news? Things seem rather quiet to say the least.